Hello there and welcome back for the bi-weekly Monday Montage blog hop. You should have arrived here from the wonderful Cathy Casey's blog. If not and I'm your first stop- no worries! Simply use the back/next buttons at the bottom of this post to navigate your way around the hop. With a busy lifestyle- finding even the smallest amount of crafting time can be a challenge. That's where this card comes in! It takes under 10 minutes to create but the embellishments as well as the sentiment can be changed out for just about every occasion! THAT makes this card perfect! 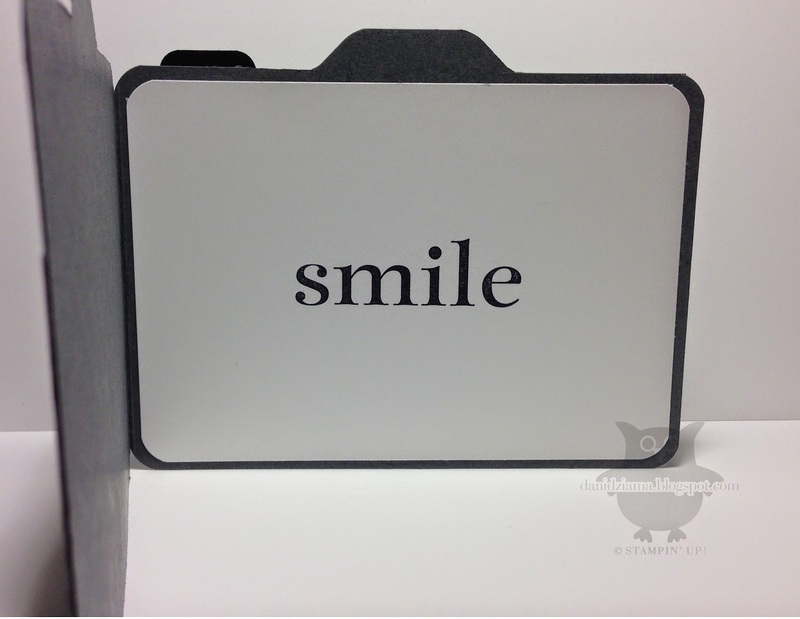 The card base is a 4-1/4" square piece of Whisper White card stock. The layer (or frame) is created by taking a scrap of Whisper White card stock and the two largest non scalloped squares from the Squares Collection Framelits. All you have to do is layer the smaller square inside the larger square and run them through the Big Shot at the same time! Viola- an instant frame! The mosaic punched pieces can easily be changed out with hearts, cupcakes, flowers, stars- anything really! 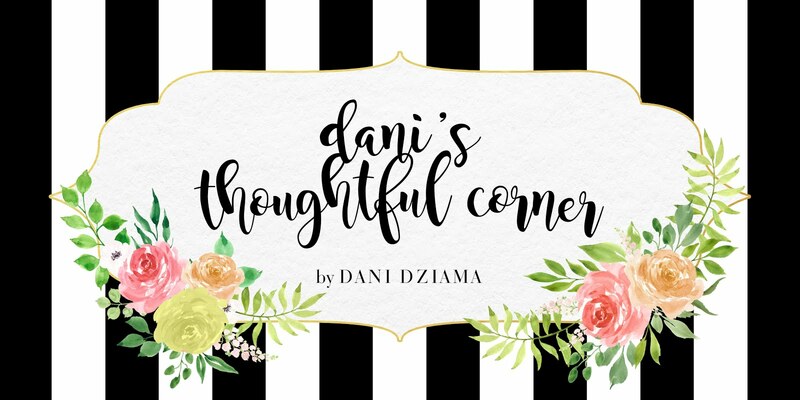 Please check out the rest of our blog hop by heading to the fabulous Dara Gloden's blog. Just click next! TGIF! Whew! What a looooooong week! I'm glad it's finally time for the weekend! Yesterday at work- I was asked to create a thank you card for a bottle of wine. Since the person asking for the card was going to punch a hole in the card I figured I might just as well create a tag instead! Now- I very rarely ever use retired or discontinued product but I absolutely adore this particular stamp set. Has Petal Parade wormed it's way into your heart as well? I sure do miss this fabulous set (and the DSP, the Sweet Sorbet accessory kit, etc...) Do you have favorites that are hard to part with? The only reason I usually shy away from using retired/discontinued products isn't because I don't like them- it's because I can't sell them to my customers when the products are no longer available. Happy Friday and I hope you have wonderful weekend! ....GOLD of course! Good morning! Slowly but surely I'm getting used to being back in the workforce! I must admit- I find it a little challenging at times to work full time, clean/take care of the kids/house and still find time to paper craft. I now appreciate the weekends more than ever! 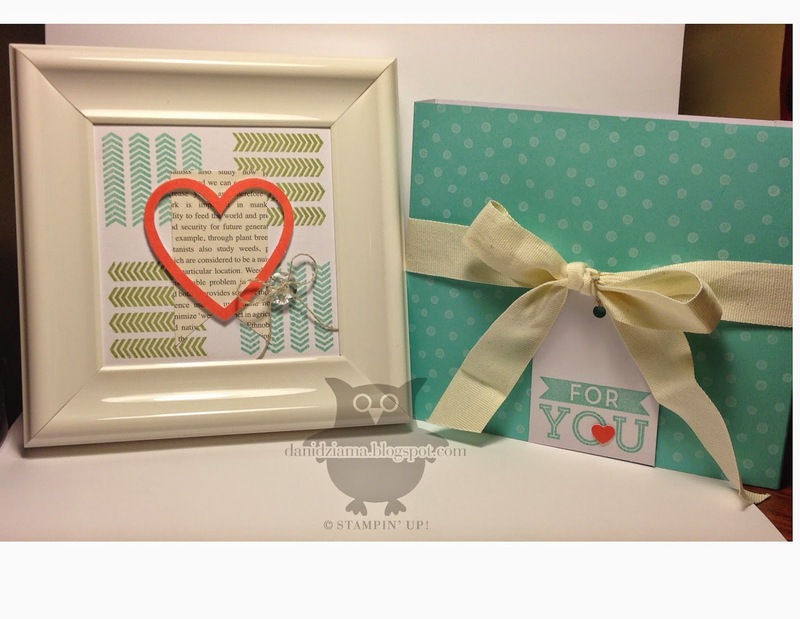 I spent the evening last night creating some projects to submit to Stampin' Up! for the Display Boards at Convention. I'm not gonna share my submissions just yet but I will soon! The card I have to share with you today is a thank you card. 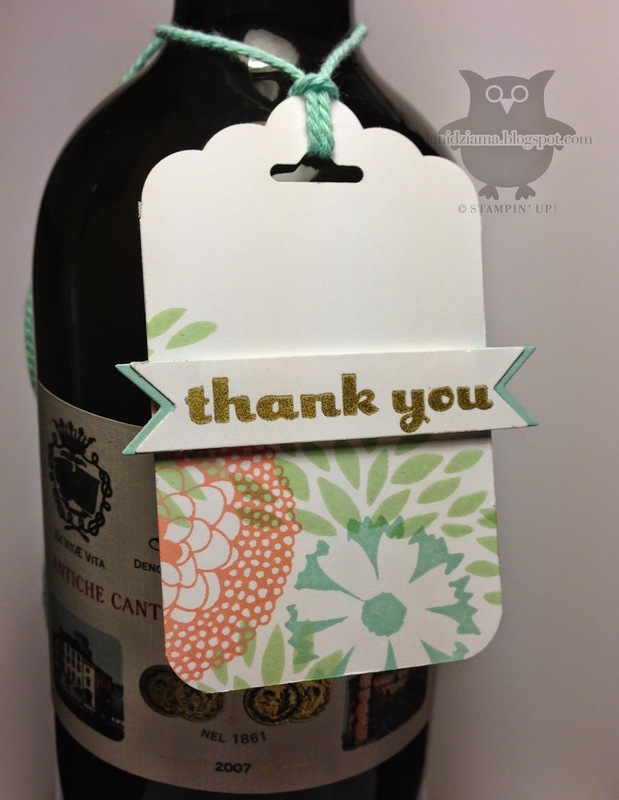 It's a little hard to see from the picture but the Thanks sentiment was stamped with Gold Metallic Encore Ink. I LOVE this ink! I didn't have high hopes for it when I purchased it as I've never had much luck with gold metallic inks before. I am truly pleasantly surprised! The ink stamps nicely and the images are beautiful! Now that the retirement lists have been released- what are you going to miss the most? I am losing quite a few sets but that's ok! I'm excited to replace them all with new stamps from the upcoming catalog! Looking for any retired items? 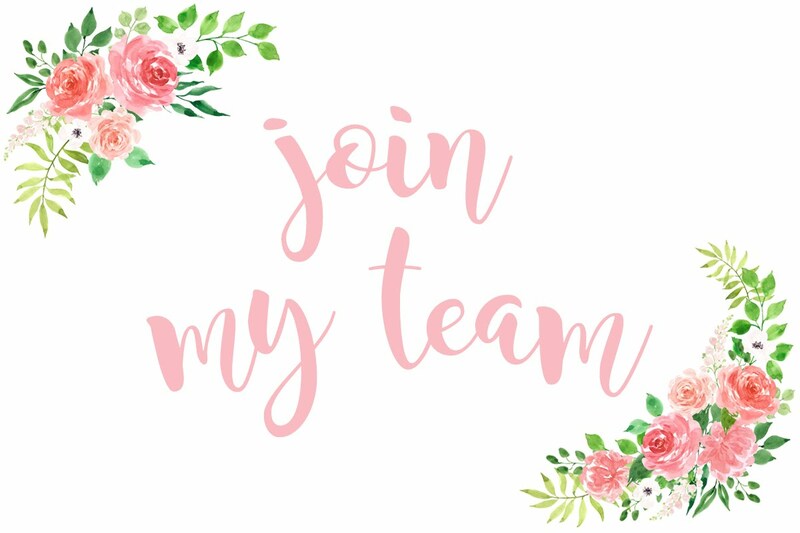 Visit http://danidziama.stampinup.net today and place your order! Can't find what you're looking for? Just send me an email and I'll see if I have it! ...the letter "S". This little home decor piece was created for a friend. It's made from a piece of chipboard and then covered with my favorite pattern from the Retro Fresh DSP. 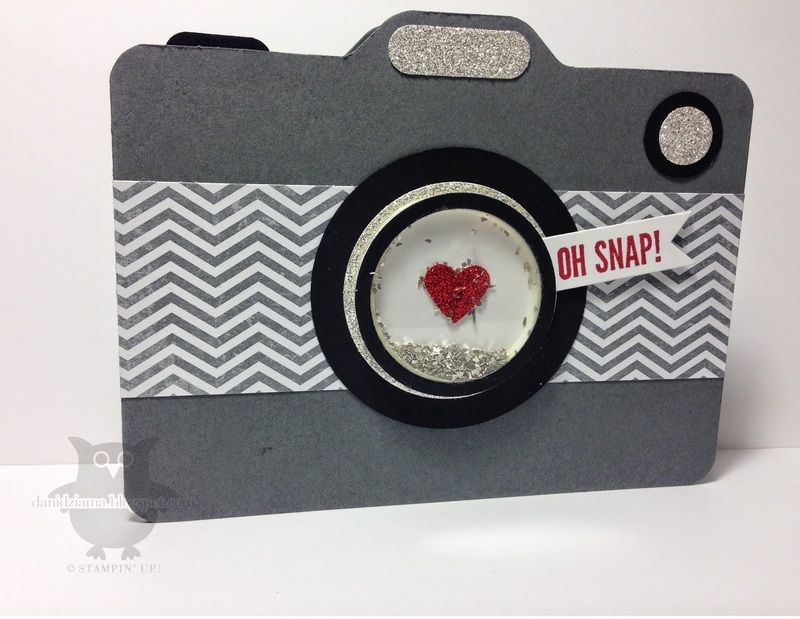 A super easy piece to create that requires very little time! The person that I created this for plans on using it in her stamping room as a wall decoration. 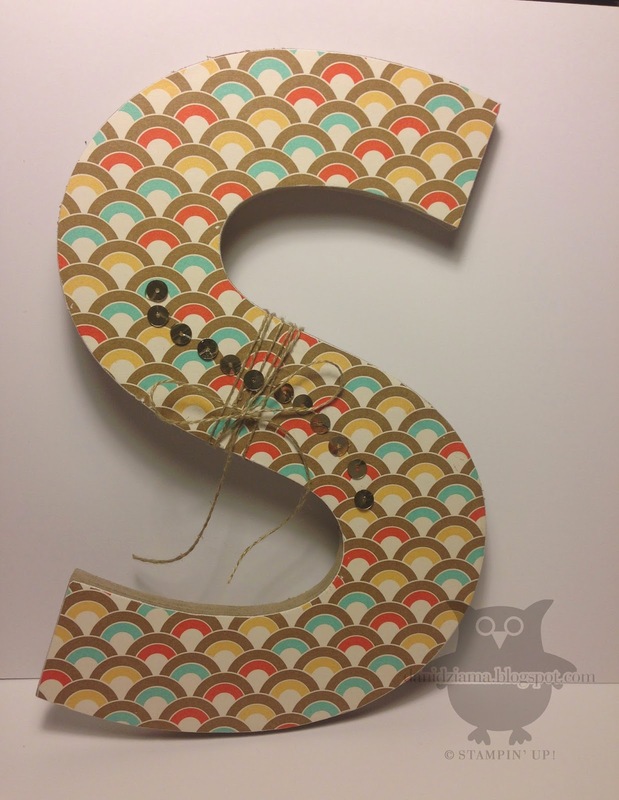 The "S" measures approximately 10" in height and has a tiny piece of ribbon on the back to hang it. The ribbon will not be visible from the front when hung. Don't forget that it's time for the 2013-2014 Annual Catalog Retirement list! My store is open 24/7! 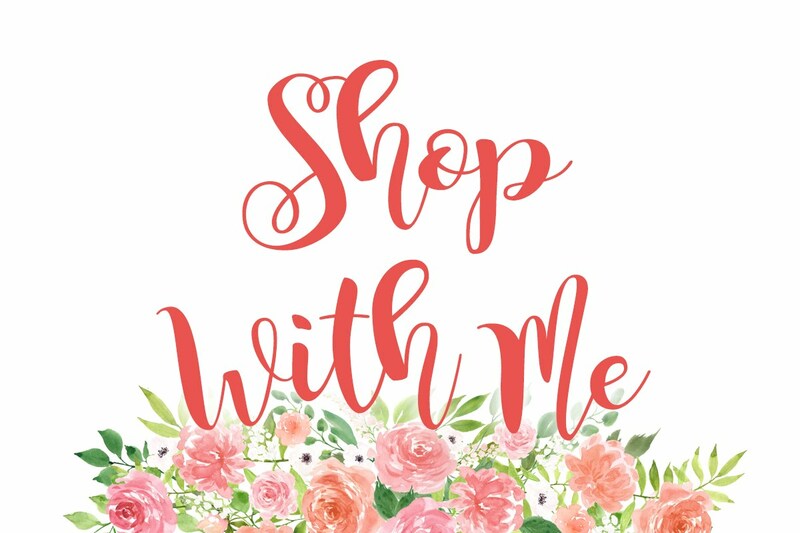 Just click the SHOP WITH ME button on the right side bar to visit the store today! Thanks for stopping by and have a happy Wednesday! That's right! Now's the time to say goodbye to the retiring products from the 2013-2014 Annual Catalog! There are many stamp sets and accessories that will be leaving soon! 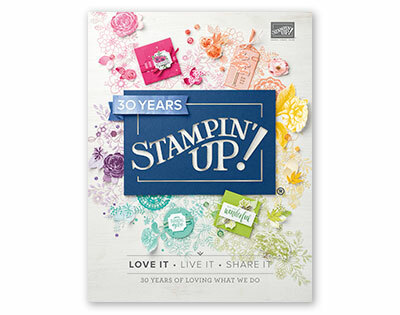 Here is the link to the retiring STAMP SETS and here is the one for retiring ACCESSORIES. Please keep in mind that these are all while supplies last ONLY! It's also a great time to order! FREE SHIPPING on everything! Ready to place your order? 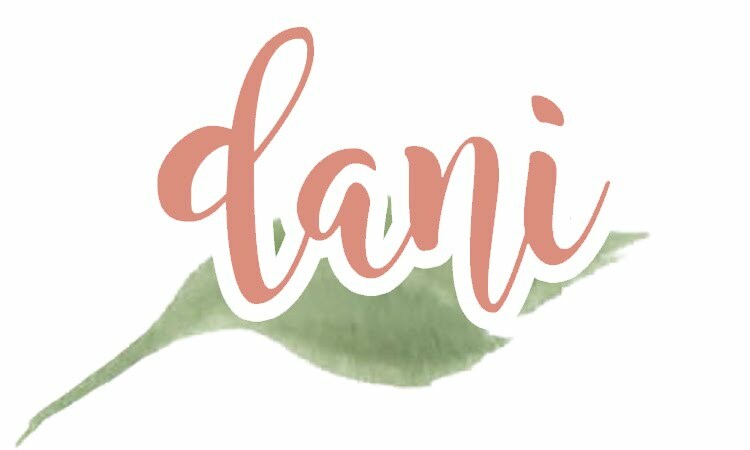 Visit http://danidziama.stampinup.net and place your order today! Have you gotten your My Paper Pumpkin monthly subscription for April yet? I was SO excited to see mine in the mail the other day! This is probably one of my favorite kits! I love to alter photo frames and make home decor items so this kit was right up my alley! Plus- it's perfect for the upcoming Mother's Day holiday! The kit itself came with all the supplies necessary to create this absolutely adorable frame and set of gift tags. I only created one gift tag so far. The rest are reserved for a project that came to mind! I'll share that finished project just as soon as it's ready! Haven't jumped on the My Paper Pumpkin wagon yet? What are you waiting for? 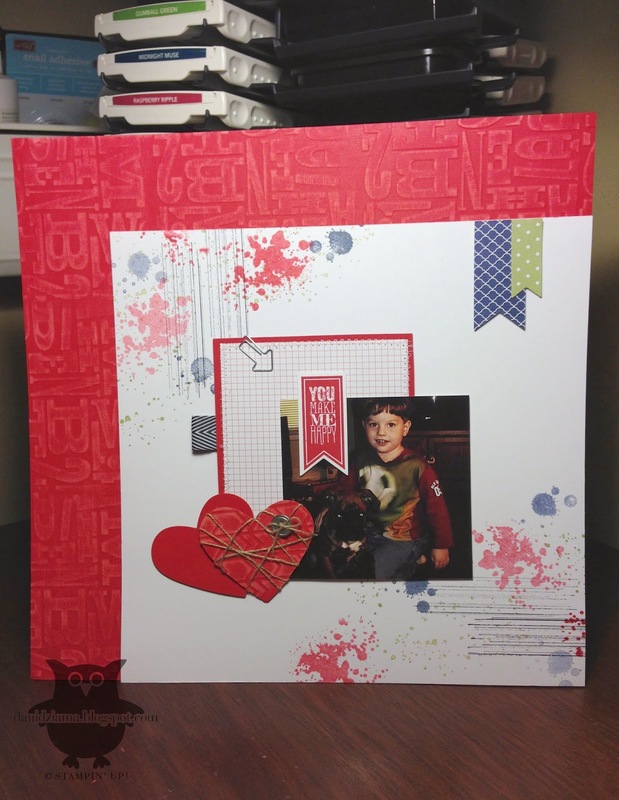 The kits are fabulous and contain everything you need (except adhesive) to create a beautiful project! Ready to join? Click HERE to visit My Paper Pumkin today! Tonight's project is a shaped card. I love creating cards that are out of the ordinary and not the usual "card" shape. I've seen these camera cards all over the internet on various websites so I'm not really sure who the original creator is. I did not use a tutorial or anything like that when creating my version. I just kinda winged it! My base is the standard 4-1/4" x 5-1/2". Using the Envelope Punch Board- I made a tab at the top (Line up the left side of the card at 1-3/4" and punch. Flip card over and punch again at 1-3/4"). Trim off the excess card stock along the top and round the corners. Embellish as you wish! It's as simple as that! This is the inside of the card. It's not fancy at all but it was perfect for the occasion I needed it for! It's definitely hard for me to not use more embellishments like ribbon or baker's twine on this card. I thought about adding a camera strap but just didn't like how it looked so I left it plain. Thanks for stopping by! I hope you will continue the rest of the way around our hop! Up next is the fabulous Dara Gloden! I know she has something great in store for you all today! Have you ever thought about trying MDS but decided not to because you didn't want to spend extra money on ton of downloads? Well I'm happy to tell that you can use MDS with graphics and clip art that you already have! 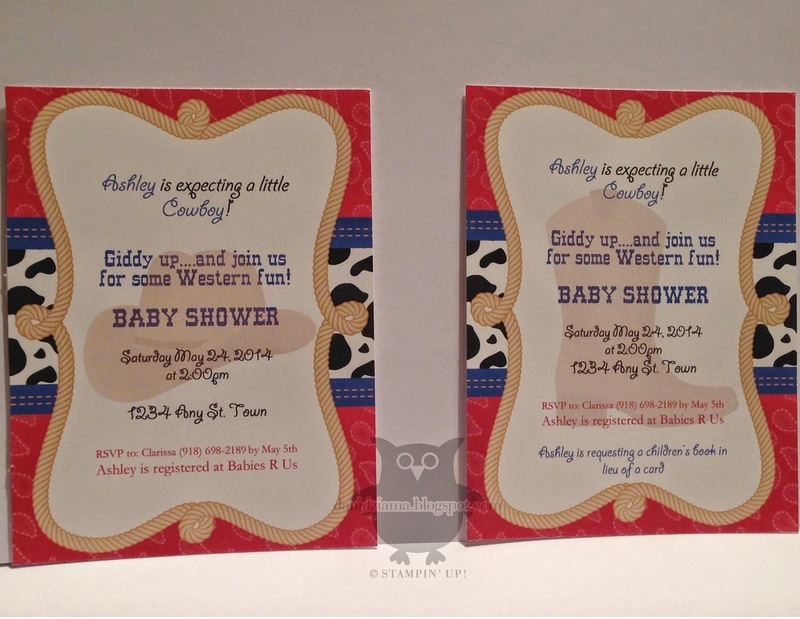 I created 2 invitations. The first one has a cowboy hat on it and the other has a cowboy boot. I hope she likes them because I think they are adorable! Have any questions on MDS? I'm happy to help! Just send me an email or give me a call! It's not the typical "baby" card but I love it! It's cute and the colors are subtle enough to work. For the card base- I used Smoky Slate. The pink is actually Pink Pirouette. Different yet fun! 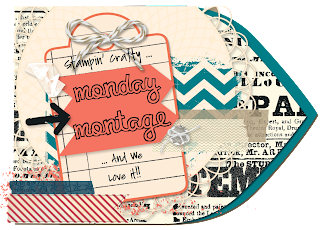 Happy Thursday and happy stampin'! Spring is finally here! I'm so happy that the weather is warming up and the sun is shining! It sure does put me in a better mood that's for sure! How about you? Do you love the sunny weather? Today's project is a scrapbook page of my son and our dog when they were both little. We got Snickers when she was just 8 weeks old and Cameron was 3. This adorable picture was taken just a few months after Snickers joined our family. It's actually tough to see Snickers well in the picture. She is a Brindle Boxer. Her face is almost all black (well- it was. She's an old lady and really gray now). Still cute nonetheless! 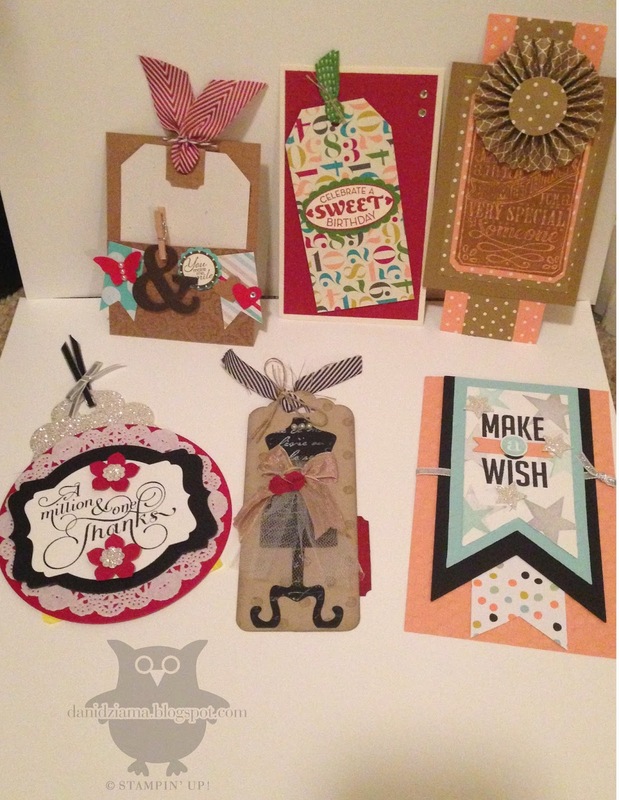 Today I'm sharing some of the tags I received from the Inking Everything team swap. The swap ended a few weeks ago but I wanted to share them with you! We have lots of talented stampers in our group! It's always fun to participate in a swap! I'll share the others soon! Thanks for stopping by! I hope your Monday isn't as crazy busy as mine will be! Do you remember the old fashioned Instamatic cameras? You know, the ones that the picture came out of the camera and you had to shake the print to dry the chemicals? Well I've been looking for a while now and I've finally found a place that prints pictures that look like the old instant prints! I am SO excited as I have a ton of photos that I wanted to make look old. One of the pictures I sent away for is a picture of my sisters and I when we were really little. Since I chose to create my pictures in the square 2" x 2" size I felt this picture was best used to create a scrapcard. Technically I don't even know if "scrapcard" is a word but it works for me! 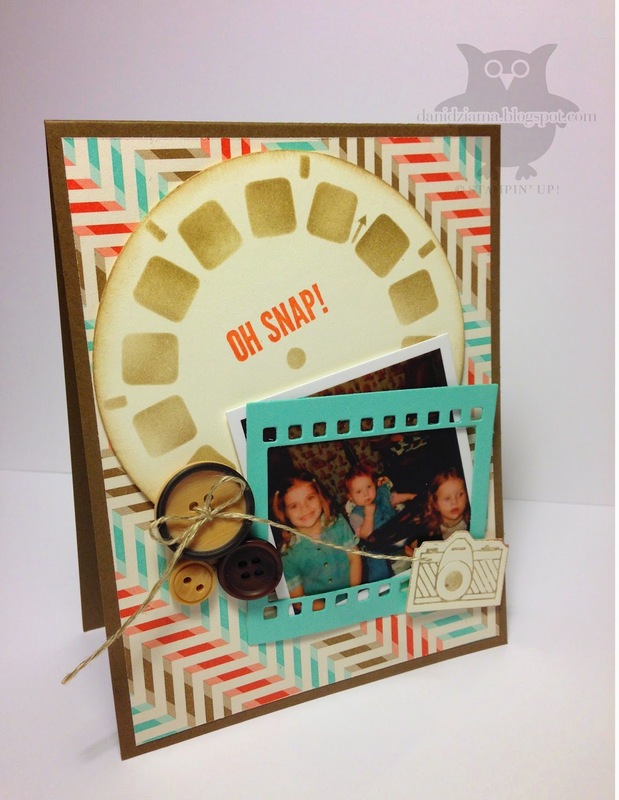 To create this card- I created a viewmaster reel stencil (using MDS and an e-cutter) Then I sponged it with some Baked Brown Sugar ink, cut it out with the Circles Collection framelits, and viola! I think it came out cute! I am SO glad that Monday is finally over. I usually work between 11-12 hours a day and it doesn't leave me much time for crafting! I don't normally mind being busy but I've missed my stamp room! I love the card I created to share with you today. It's got the ever so trendy ampersand and a few other fun embellishments. It's a simple card yet it has the perfect amount of decoration. 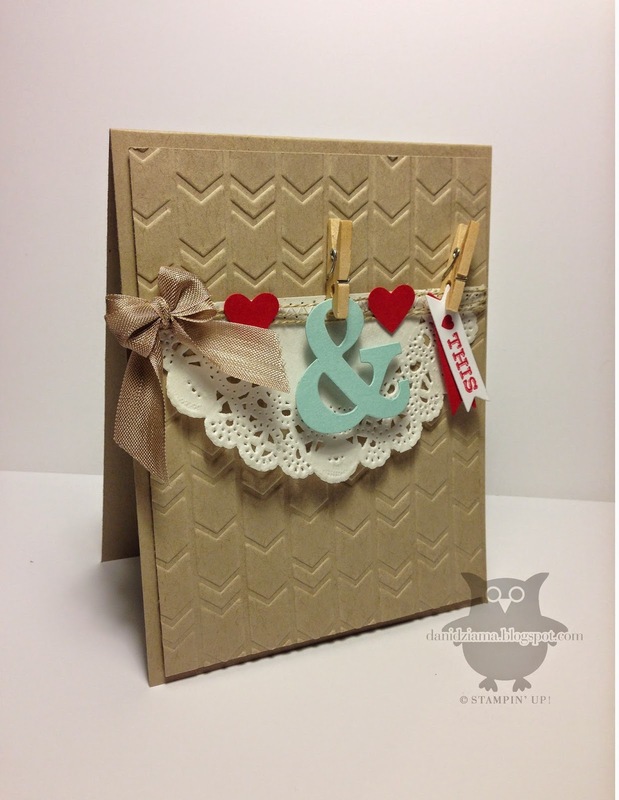 Do you prefer clean and simple cards or do you embellishments galore? I'm a mix somewhere in between but depending on my mood- sometimes less is more!